Whether you are looking for a calm charming place to spend the day near the city of Ibarra, or are in search of some gorgeous wooden decorations and furniture for your home, San Antonio de Ibarra is the village for yo to visit. Having spent most summers as a kid going to visit my grandparents at their hacienda in Ibarra, I have had the opportunity to visit some of the most charming and traditional places in the city and its surroundings. One of these places, is San Antonio de Ibarra. If you are in South America I would love to see your pictures. If you are planning on enjoying a day trip from Quito, then a visit to the province of Imbabura is one of my suggestions. First, you can find some great options of places to stay in Quito. Nest step is to plan your transportation options. If you do want to visit several places it is best to have a car. Or since the town is located near the city of Ibarra, you may want to spend the a night in this calm cozy city. Here are some great options of places to stay in Ibarra. Just a short drive from the city center, you find the sign showing the road to San Antonio. If you do not have a car, a taxi will get you there for a decent fare. The city center is quaint and small and as you stroll along the main square you will feel the peace that surrounds this village of artists. The best way to explore the village is by foot, and then to walk inside some of the more than 15 wood carving galleries and workshops. Once there, you realize why this village is often referred to the “wood carving capital of Ecuador, as stepping into one of the shops will fill you with awe on the myriad of motives and decorations made with wood to be found. Is it possible to create such delicate and gorgeously decorated items in wood? The options are plenty as well, creativity here is combined with practicallity. I of course included a visit to San Antonio de Ibarra to the itinerary I planned for my in-laws together with my grandma and parents, when they visited Ecuador. A visit that is mandatory if you are in San Antonio is to visit Luís Potosí’s workshop and gallery. There you will admire some lovely works by this artist that include fine decorations with Inca inspired themes, religious imagery and many other artifacts that make for great decorations to your home. For us it was a great place to get some leaf shaped bowls, and as a gift from grandma we got a nice flower wood decoration for our living room. It is pretty impressive to witness how this village has managed to preserve this tradition for hundreds of years. The artisans in San Antonio de Ibarra work sculpting, with murals, religious imagery and statues as well as modern art items. The town offers its visitors a wonderful experience for all senses, its shops are showcasing magnificent wood artifacts and offers also some gorgeous vistas over the city of Ibarra. 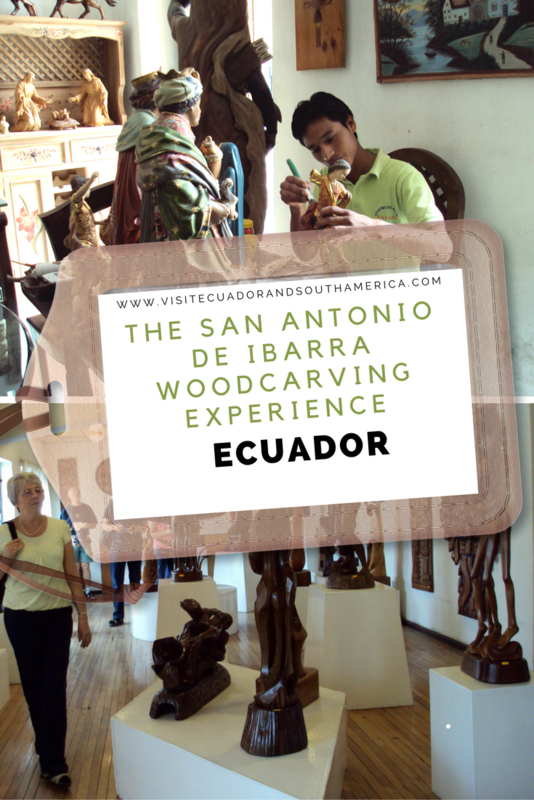 If you are in Otavalo or Ibarra, don´t miss out on this woodcarving experience. If you want more in-depth information and also a guide that you can bring along during your trip, I recommend the travel guide Lonely Planet Ecuador & the Galapagos Islands . This is a great source of information and tips, maps and all you need if you plan on visiting Ecuador. I personally like the option of having a hard copy version where I can take notes and have at hand. Don´t just dream it, make it happen. Plan your South American trip with a local! Take a look at this list of travel resources to plan your trip and travel in South America. Day dreaming about your trip to South America? Order here your Free Ebook, I share with you some useful tips & resources for a memorable trip! I invite you to follow me on Facebook, Twitter, Pinterest and Instagram. In addition you can subscribe on YouTube. ⟵Melcocha, the best handmade candy of Ecuador! Beautiful stuff. I don’t necessarily think of Ecuador and wood work in the same breath. I really like that kind of artisanal work.